Despite massive controversy in Canberra about the benefits of renewable energy and its effect on statewide blackouts in South Australia, the irony has emerged that Parliament House's lights are actually going to be powered in future by the wind blowing up the Spencer Gulf and across mid-North South Australia. For, as Ross Garnaut, economist extraordinaire regarding energy economics was quoted as saying in Saturday's SMH, “Nowhere in the developed world are solar and wind resources so abundant as in the west-facing coasts and peninsulars of South Australia”. 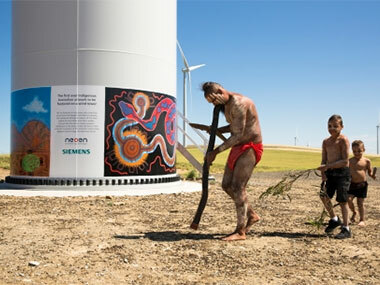 And local Aboriginal tribes – the Ngadjuri and Nukunu – have both recognised this and celebrated it by adding huge artworks to the base of two of the 105 massive wind turbines that will form the Hornsdale wind project outside Jamestown, near Port Pirie. The works were unveiled last week. Hornsdale is a joint venture between French company Neoen, Siemens Australia and the Australian Capital Territory Government. And while the controversy has been about SA seeking to achieve 50% renewable energy, Hornsdale Wind Farm aims to help the ACT achieve its 100 percent renewable energy target by 2020, powering 70,000 homes by the end of Phase 1. "We've now got the renewable energy power generation process down to the lowest in Australia and we're getting down to the levels of traditional fossil power generation, which is where we really want to be," Siemens wind power chief executive David Pryke said. Pryke added that the installation of the artwork was a recognition of the collaborative relationship established with traditional owners during the development of the Hornsdale wind farm project. "The Aboriginal community are involved right from the start of the project when we did a heritage survey on the site", he said. Meanwhile, Quentin Argus, Chair of the Ngadjuri Nations Aboriginal Corporation said it was a proud moment for his people to be recognised by the renewable energy project. "Recognition towards our people and to the both groups — the Ngadjuri and Nukunu — it's been a long process but a good one," he said. "Anything to do with renewable energy which leaves a lesser footprint on the land is good for us all, so we welcome the development." The SA Aboriginal Affairs and Reconciliation Minister, Kyam Maher said the project symbolised the coming together of the world's oldest culture with the technologies of tomorrow. "It's a great juxtaposition — for tens of thousands of years the traditional owners have cared for this country and now we're looking at better ways to care for our country in terms of renewable energy," he said. "Bringing that oldest traditional country in the world together with Siemens and Neoen is almost like completing that matrix of the old and the new together. We know how energy is produced is changing, we know we're going to be facing a carbon constrained future and renewables will play a greater part of the jigsaw puzzle for our future energy needs." Jessica Turner is a Nukunu woman who is also of Adnyamathanha and Kokotha background. Jessica developed an interest in visual art as a child and in the last five years has started to share her work publicly. Two of her projects have been the Port Pirie GP Health Centre in 2013 and the Port Pirie ABC Radio Reconciliation Statement in 2016. Nukunu people refer to themselves as ‘snake people’ with a particular serpent of this region being held in the highest regard. The work that Jessica has developed represents the story of the serpent and its role in forming aspects of the landscape, particularly the waterholes and the need to protect this most vital resource. 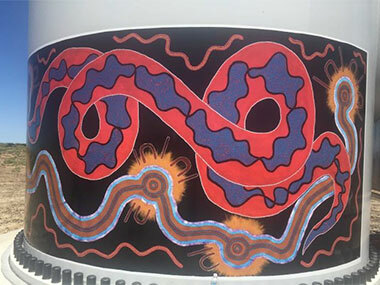 The colours that Jessica has selected for her artwork represent aspects of Dreaming stories relating to the serpent. 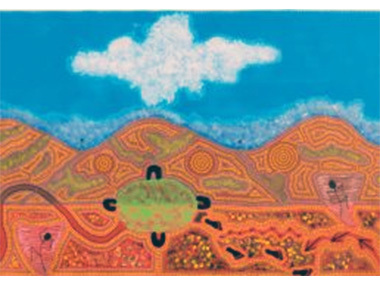 Chris Angrave and Louise Brown are both Ngadjuri people who have been painting for years. Chris focuses on coastal arts, hunting stories and the different places such as Yorke Peninsula where people fish and collect seashells. Louise brings a woman’s perspective to the art. The painting by Chris and Louise showcases how the Mungiura were found in the hilly country. They were seen peering over the top of the windbreaks, a storm was about to occur. The people then proceeded to blow hard, causing whirly wind – within which old people could be seen dancing. They built the narrative together and took turns in painting their parts of the painting. The Ngadjuri artwork at Hornsdale – created by Chris Angrave and Louise Brown, and featuring Mungiura spirits peering over windbreaks; or are they wind turbines on the hilltops?